The first episode of our Silsila project is about the Prophet Muhammad (s) who is the source of all the knowledge that passed from Shaykh to Skaykh down to Maulana Shaykh Nazim (q). We learned that when Allah (s) created the light of Muhammad (s) he placed the light in a green lamp that hung in the heavens for a very long time. We leaned about a follower of the Prophet (s) who lived in his time but never saw him in person but knew him like a companion. This reminded us of what we try to do when we follow the example of the Prophet (s) as though we see him. 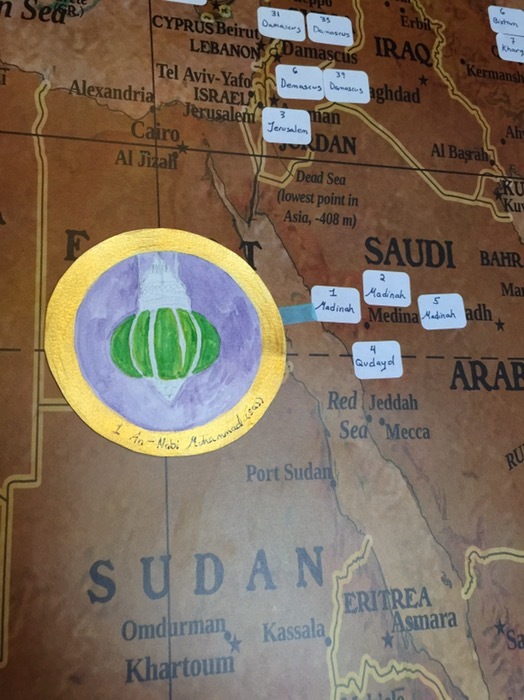 My son was very excited to hang the first medallion on the map and asked many eager questions about where the Prophet (s) was born and where he passed away.